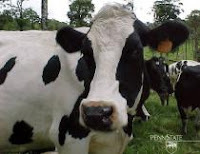 Cow belches, a major source of greenhouse gases, could be decreased by an unusual feed supplement developed by a Penn State dairy scientist. In a series of laboratory experiments and a live animal test, an oregano-based supplement not only decreased methane emissions in dairy cows by 40 percent, but also improved milk production, according to Alexander Hristov, an associate professor of dairy nutrition. The natural methane-reduction supplement could lead to a cleaner environment and more productive dairy operations. "Cattle are actually a major producer of methane gas and methane is a significant greenhouse gas," Hristov said. "In fact, worldwide, livestock emits 37 percent of anthropogenic methane." Anthropegenic methane is methane produced by human activities, such as agriculture. Compared to carbon dioxide, methane has 23 times the potential to create global warming, Hristov said. The Environmental Protection Agency bases the global warming potential of methane on the gas's absorption of infrared radiation, the spectral location of its absorbing wavelengths and the length of time methane remains in the atmosphere. Methane production is a natural part of the digestive process of cows and other ruminants, such as bison, sheep and goats. When the cow digests food, bacteria in the rumen, the largest of the four-chambered stomach, break the material down intro nutrients in a fermentation process. Two of the byproducts of this fermentation are carbon dioxide and methane. "Any cut in the methane emissions would be beneficial," Hristov said. Experiments revealed another benefit of the gas-reducing supplement. It increased daily milk production by nearly three pounds of milk for each cow during the trials. The researcher anticipated the higher milk productivity from the herd. "Since methane production is an energy loss for the animal, this isn’t really a surprise," Hristov said. "If you decrease energy loss, the cows can use that energy for other processes, such as making milk." Hristov said that finding a natural solution for methane reduction in cattle has taken him approximately six years. Natural methane reduction measures are preferable to current treatments, such as feed antibiotics. Hristov first screened hundreds of essential oils, plants and various compounds in the laboratory before arriving at oregano as a possible solution. During the experiments, oregano consistently reduced methane without demonstrating any negative effects. Following the laboratory experiments, Hristov conducted an experiment to study the effects of oregano on lactating cows at Penn State's dairy barns. He is currently conducting follow-up animal trials to verify the early findings and to further isolate specific compounds involved in the suppression of methane. Hristov said that some compounds that are found in oregano, including carvacrol, geraniol and thymol, seem to play a more significant role in methane suppression. Identifying the active compounds is important because pure compounds are easier to produce commercially and more economical for farmers to use. "If the follow-up trials are successful, we will keep trying to identify the active compounds in oregano to produce purer products," said Hristov. Hristov has filed a provisional patent for this work.